castlemaniagames has no other items for sale. Thank you for your purchase! CastleMania Games prides ourselves on our service and we would appreciate your fair and honest feedback. Should you have any concerns please contact us first. Game on! Item was brand new. Fast shipping. Great seller! Would buy from this seller again. Very pleased! Item works great! Exactly as depicted and delivered quick enough for the holidays. Product as described - worked flawlessly. arrived sooned than expected. Super fast shipping, arrived days before estimate!! Exactly as described!! Good seller, got what I paid for. Thanks! Also, VERY fast shipping! These cords are hit and miss. These lower end component cables are made very cheap. I have bought 2 now and the first one I got had terrible scan lines and some ghosting of the images. The second one was a lot better. It's started out with the same type of scan lines. Buth after awhile of playing with the cord. I got it to go away. I am happy with my purchase. 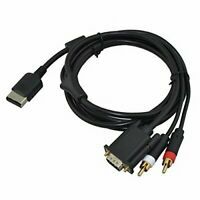 But if you are willing to spend the extra cash I would defiantly go with either the official xbox cables or maybe the monster brand cables. 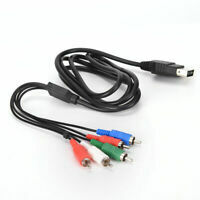 Pound recently made an HDMI cable for the original xbox. But the supply seemingly ran out before I heard about it. This cable most definitely has lower audio quality than one might expect but the picture quality is better than the standard composite cables. If you're low on cash but still want to enjoy your Xbox in HD, this is the way to go. I personally am going to upgrade to the OEM High Definition AV Pack for better audio quality and also to have the ability to route the audio to my speakers using a separate cable. At the very least, these cables will serve as a decent back-up pair for me. Great picture but has some lines. It is and isn't of good quality. It does give a better picture than the composite cables but it can have lines from time to time. Overall I think it is worth it. Great price!